Back in June, I did an interview with the organizers of the World Time Attack Challenge. The original interview is located here, but the meat of it is below. If you haven't read this already, it will bring you up to speed more or less on what's going on with the Sierra Sierra EVO (Christine) between last year's WTAC 2010 and today. But if you want to be up to date on general WTAC news and updates, be sure to visit the front page of the site at http://www.worldtimeattack.com. There are daily updates on competitors, event news, sponsors, cars, etc. For you drift fans, this event will also be hosting the International Drift Challenge as well. Maybe next year some American drifters should send their spare cars over to show the Aussies how good you guys are. Superlap Australia: G’day Eric, awesome to see you guys are making the big trip down under with the Sierra Sierra team for World Time Attack again, so how are you guys looking? Eric Hsu: Things are a bit more rushed than last year. SSE has been busy with the Ferrari Challenge season. So much so that our Glorious Leader almost decided to axe the trip to Australia because there wasn’t enough time to concentrate on Christine. Given the huge expense to bring the team and car over, he wasn’t too sure about the “chances of winning vs. dollars invested” ratio. Luckily Emp, myself, and the guys at hiOctanedirect.com, Turbosmart, Royal Purple, Hankook, Okada Projects, BorgWarner and of course Cosworth came through with some support to help reduce the cost of competing the EVO at WTAC. Naturally, with this level of support, GL would be interested again. Who doesn’t want a good deal? Anyhow, so with this decision to move forward preparing for WTAC, we just finished a brand new engine at Cosworth that has all the latest and greatest features. It even uses rod bearings from one of Cosworth’s past F1 engines. At the moment, I’m at Sierra Sierra running in the engine on their chassis dyno and finishing some last minute testing on the new BW EFR turbo (we went up in size). In two days the car heads to Los Angeles to get put into the team USA container and then Christine’s on her way to WTAC 2011. Superlap Australia: And we hear the Sierra Sierra Evo is a lot faster than last year is that correct? Eric Hsu: After Christine returned from WTAC 2010 last year, Richard (the team manager, engineer and setup genius) found a way to make the car quicker with some of his differential wizardry. Emp was of course asking for more boost and revs all the time so I decided to shut him up and give some to him. Na, but seriously, it was a combination of things that improved the car. Engine output improved further from Cosworth, the BorgWarner EFR turbo improved turbo performance and reliability, the Turbosmart wastegates improved reliability and Richard’s diff wizardry helped a lot. Dave is seriously a fast driver and was able to find over 2 seconds at Buttonwillow after returning from WTAC with the changes He thinks there was a bit more even. Superlap Australia: So what are the big changes you guys have made since you were here last May? Eric Hsu: Just recently, the Sierra boys cut out about 800 lbs (363kg) out of the car. This was achieved by cutting out just about every piece of factory frame rail, floor pan, and unnecessary sheet metal. Then they built a whole new suspension designed around WRC tarmac rally uprights and grafted the double A-arm suspension onto the now virtually tubular chassis. Finally they replaced every single body panel with dry carbon. On the drivetrain, they added a sequential transmission from Hewland too. But immediately after returning from WTA 2010, the differential changes, more power output from the Cosworth engine and BorgWarner EFR turbo combination, and Emp learning a few more tricks to driving a high strung, 4 cylinder, AWD turbo car are what made the bulk of the improvements. More recently, Mike, Jet, Richard, and Pete at Kaminari got crazy with the carbon and made some drastic aero changes (you’ll see when we roll Christine out of the container), Okada Projects set us up with a whole new ignition system, and I’ve made some uhm… how would you explain it… “fundamental” changes to our boost control strategy. These last batch of changes have yet to be tested, but that’s what we’ll need to do in Australia first since we’ve run out of time in the US. BTW, I’m kidding about the 800 lbs., but if you didn’t catch it, I described the Garage Revolution FD3S RX-7. Superlap Australia: And you guys were involved in the development of the EFR turbo too is that correct? Eric Hsu: Yes. Cosworth was one of BorgWarner’s development partners. The product development team at Cosworth was testing prototype EFRs on various engines from mid-2010. Being the engine supplier to Sierra Sierra, it was natural for us to connect BorgWarner and SSE upon Christine’s return from Australia. Christine would not only be a test bed, but also a proving ground for the EFR turbo. If you’ve followed the SSE EVO, then you know that we used to grenade turbos regularly. Switching over to the EFR turbo improved the turbo reliability situation drastically. Coupled with the Full Race exhaust manifold, the EFR also reduced lag, improved boost response, and made more horsepower all at the same time. Thanks to BorgWarner, turbo concerns are a thing of the past. 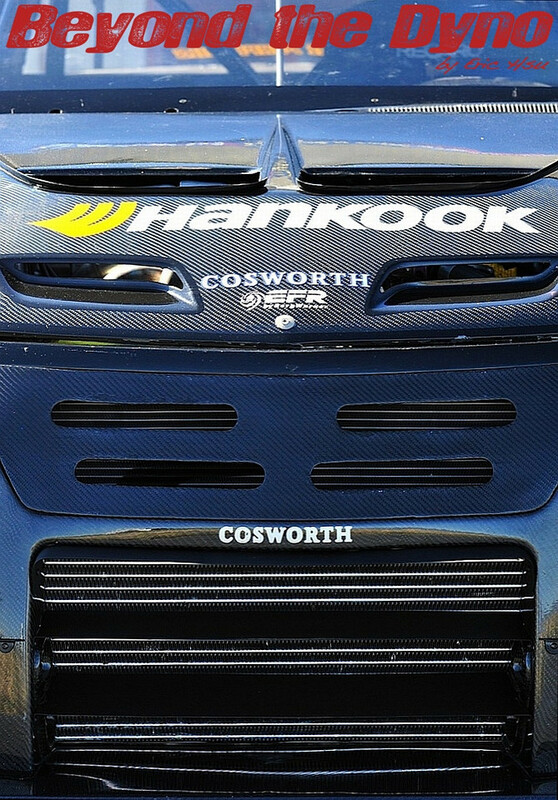 Superlap Australia: And what about Cosworth are they involved in many other time attack cars in the USA? I see they have supplied some parts to GST? Eric Hsu: In the US, most serious club racers, track day enthusiasts, and some forms of GT race cars that are Subarus, EVOs, 350Zs, or GT-Rs use our parts. Likewise, plenty of serious time attack cars use our parts. We’ve worked with GST for many years now and supply them with some components too. They don’t use all Cosworth components in their engines, but they pick and choose what they want. We like working with GST because they are always at the events no matter how much they had to work to get there. They also provide us with valuable feedback that allows us to make our products better.